Two peacocks and two monkeys are depicted in the banyan tree above the Lord Dakshinamurthy sculpture in the goshta wall. There is also a Nandhi. 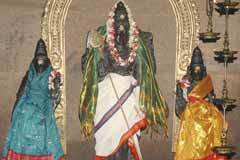 Nadha Sharma and his wife Anavidyambikai came to this place for the Cauvery bath-Thula Snanam. Before they arrive at the place, the 30 days time (Aipasi month-October-November) expired. They sadly stayed at the night worshipping Lord Shiva. Lord appeared in their dream and advised them to have the bath before sunrise the next day and assured that they would have full benefit of the <?xml:namespace prefix = st1 ns = "urn:schemas-microsoft-com:office:smarttags" />Tula Snanam bath. Based on this, the practice of this bath continues even now on the first day of Karthikai month. As Lord Shive froze the bath time for His devotee couple, this bath is called Mudavan Muzhukku. Mudakku in Tamil means freezing, Muzhukku bath. The couple merged with the Lord then. This Linga is facing west. 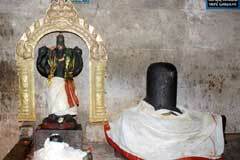 The Linga with which his wife Anavidyambikai merged is at right of the Ambica shrine. 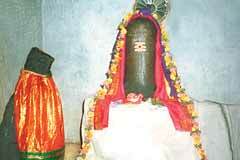 This Linga is dressed with Red Sari only. It also indicates the oneness of male and female. Lord Dakshinamurthi appears slightly slanting on a side with His legs folded. 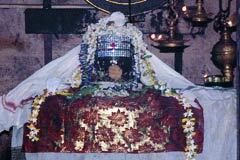 Mother Aadi Poora Ambal graces from a separate shrine in the Veera Shakti form praised as Abhayambikai. She is also brought in procession to the banks of Cauvery on Aadi Pooram day and Fridays of this month covering July-August. 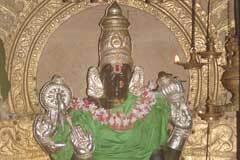 Lord Vinayaka in the prakara appearing earlier from a sandal tree is praised as Agasthya Sandana Vinayaka – Sandanam-Sandal. 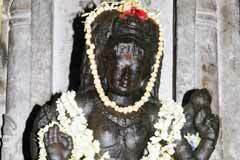 Tula Snanam: It is said that Lord Shiva blessed Nandhi by destroying its pride. 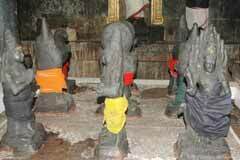 This Nandi is in the midst of Cauvery. People take their holy bath in the river during the Aipasi month (October-November) and the first day of following Karthikai month. 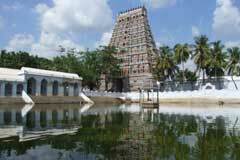 Lord visits Cauvery each day during this period of 31 days. It is also said that Holy Ganga had Her sins washed off with a dip in Holy Cauvery. This day is Aipasi new moon day-Deepavali. A bath in Cauvery on this day cleanses the devotee of all his/her past sins. 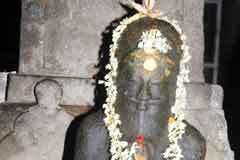 Planet Saturn in the Navagraha shrine appears as Jwala Saturn with Agni-fire on his head. Also a Saturn of normal form with his crow vehicle is by the side facing north performing Shiva puja. This is a very rare form of Sani planet. Those facing adverse aspect of this planet pray here to reduce its intensity. 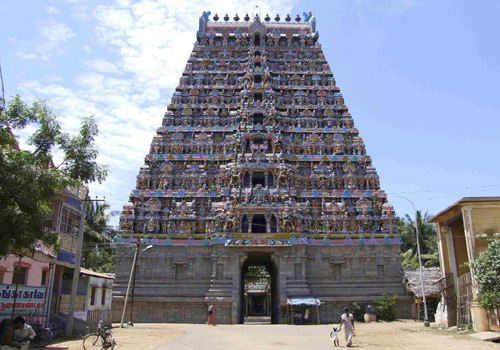 The temple is 2 km from Mayiladuthurai bus stand and 3 km from the railway station.